I went over there for a one-hour lesson, but instead he gave me more than an hour could possibly hold. Vacchiano’s professional teaching and playing careers began simultaneously when he joined the New York Philharmonic as third trumpet (and assistant principal) at the age of twenty-three in 1935. Due to the declining health of his former teacher, Max Schlossberg, Vacchiano was appointed to the faculty of The Juilliard School that same year. 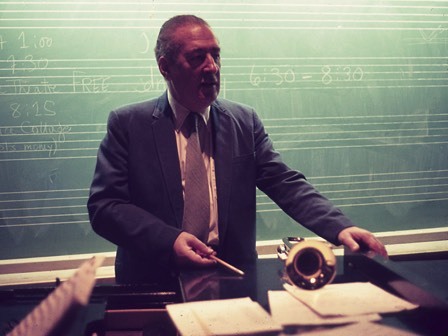 The teaching style Vacchiano employed during his career was strikingly similar to the style learned during his studies with Max Schlossberg, focusing mainly on orchestral style, transposition, and the rudiments of playing the trumpet. Weekly lessons were primarily comprised of studies from three method books: Arban’s Complete Conservatory Method for Trumpet, Saint-Jacome’s Grand Method for Trumpet, and Sachse’s 100 Studies for Trumpet. In addition to these materials, Vacchiano frequently composed exercises specifically addressing the student’s weaknesses. He eventually compiled these exercises into various étude books (see below). A detailed analysis of Vacchiano’s teaching method, including musical examples, can be found in Chapters 4 and 5 of Last Stop, Carnegie Hall: New York Philharmonic Trumpeter William Vacchiano by Brian Shook. As a tribute to Vacchiano’s teaching legacy and his dedication to his students, The Juilliard School established the William Vacchiano Award in Trumpet in 1991. This award grants scholarships to talented young trumpet players studying at Juilliard. Contributions can be sent to Ms. Tori Brand, Manager of Scholarship Development, The Juilliard School, 60 Lincoln Center Plaza, New York, NY USA 10023, or call (212) 799-5000, ext. 692.